Welcome to the Mom Pack™ Sponsor Center! Become a MomPack.com sponsor and you'll get your 120x60 banner in our top rotator. Your banner will rotate through our entire site and now including the Mom 2 Mom Directory! Or, you can choose to have your 468x60 banner rotating on the mid/bottom our our entire site and now including the Mom 2 Mom Directory. Your choice! How will this help Mom Pack? Mom Pack has monthly and annual fees which include things like, web hosting, links directory payments, domain names (we have many that point to mompack.com) and also the upcoming purchase of a new message board program which isn't cheap. It not only costs us for the programs we use, but to keep them safe and secured, we have to buy memberships to that developer's site in order to gain access to new releases. Mom Pack is a non-profit organization. We also purchase T-shirts for member incentives and sponsor various organizations from time to time. How will this benefit the sponsors? MomPack.com is a very popular organization that went live on the internet August 2000. We are so popular because we are a FREE site for our visitors and members. We are not advertisement based nor filled with affiliate "fluff" links to only make a business out of it all. 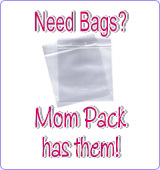 Mom Pack is a site that is here for you, not vice versa. The monies we bring in via sponors go right back into the site to keep it running and towards our member Give Back Program, when active. We are run by a volunteer staff team that we greatly cherish. Your business will be seen over and over again by thousands of quality visitors each month. *Contrary to popular belief, "hits" are a worthless gauge to value any site's stats. These figures are accurate as of 11:47 on 18 May 2011. Since 12:23 on 22 Feb 2010, there have been a total of 586,341 advert exposures, for an average of 1,303 exposures per day. What if I don't have a banner that is the required size? We have a team of professional graphic designers waiting to help you. Whatever size you need can be made within 48 hours approx. Contact Us for pricing. We are excited to be able not only to give back to moms in business by building this network, but to be able to reach out further and Give Back to our members. NOTE: We reserve the right to exclude any site sponsor. 120x60 Banners on the top of MomPack.com. This includes every page except for the inner pages of our Mom 2 Mom Directory and Message Boards. Banners will rotate. #1 and #2 Spots available. See top of this page. Full stats can be given upon request for your banner. Q: Can I advertise for more than 1 month at a time? A: Yes, you can advertise for as many months as you'd like. NOTE: DO NOT SUBMIT IF YOU DO NOT HAVE THE EXACT URL TO YOUR BANNER ENTERED ABOVE OR IF YOU HAVE THE WRONG BANNER SIZES. NOTE: DO NOT SUBMIT IF YOU DO NOT HAVE THE EXACT URL TO YOUR BANNER ENTERED ABOVE OR IF YOU HAVE THE WRONG BANNER SIZES. We do not accept banners via email. We only accept the banner url hosted on your site. If the submitted information is not filled out with the valid banner url, we cannot add your banner and we do not issue refunds due to the funds entering the Give Back Program account. We're sorry. This is a non-profit web site and we cannot work for free hunting down your correct information. We reserve the right to exclude any sponsor at our staff's discretion. No refunds are offered once your information is entered into our database.